It is hard to believe that only one month has passed since Gabrielle was shot. The doctors say she is recovering at lightning speed considering her injury but they aren't kidding when they say this is a marathon process. There are encouraging signs everyday though. Gabby's appetite is back and – even though it's hospital food – she's enjoying three meals a day. We can't thank you enough for the heartfelt show of support that has come in from all around Arizona and the nation. I want the families of all the other victims and the entire Tucson community to know that Gabrielle will soon stand by your side to mourn this tragedy and learn how we can heal. In the mean time, your prayers are being heard so don't stop. 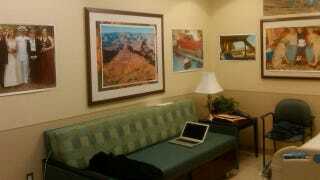 Kelly also posted seven photos of Giffords' hospital room, which is decorated with enlarged wedding pictures, a white board for get well wishes, and images of a space shuttle launch. One of her doctors told the AP that he hopes she'll be able to attend Kelly's space launch in April.